Thundercals is a new player in the aftermarket decal world. Whilst the name is new, the company’s owner, Norris Grasser, is well known in modelling circles as a long time contributor to the AeroMaster/Eage Strike, EagleCals, Superscale and Zotz brand of decals. 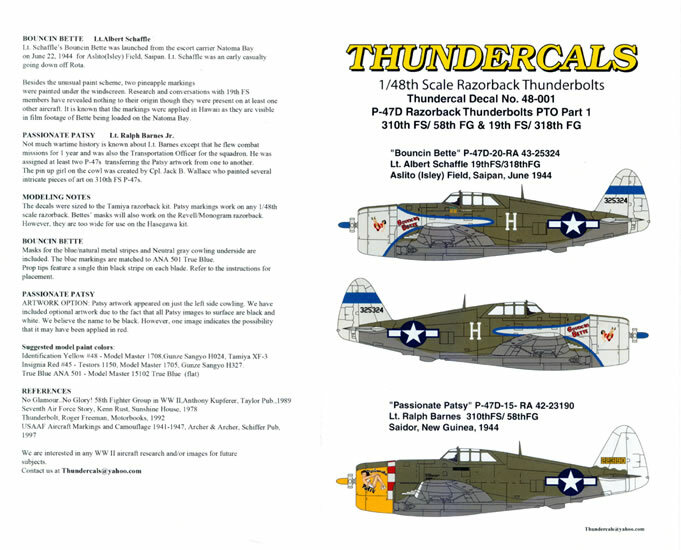 Thundercals has recently released two sheets as their initial market entry. 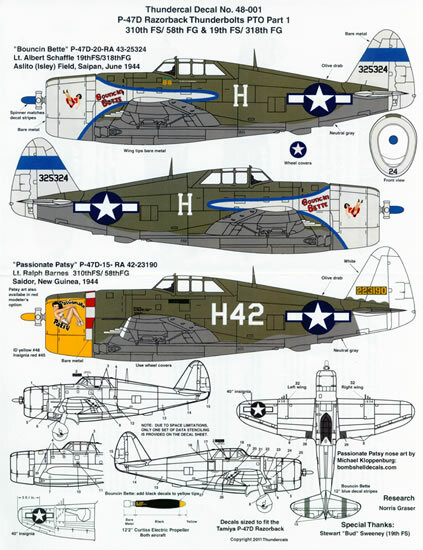 Both sheets are for the long neglected Pacific Theatre of Operations, and understandably, given the name Thundecals, both sheets provide markings for the Republic P-47 Thunderbolt. “Bouncin Bette” P-47D-20-RA, serial number 43-25325 which was assigned to the 19th Fighter Squadron, 318th Fighter Group, 7th Air Force. 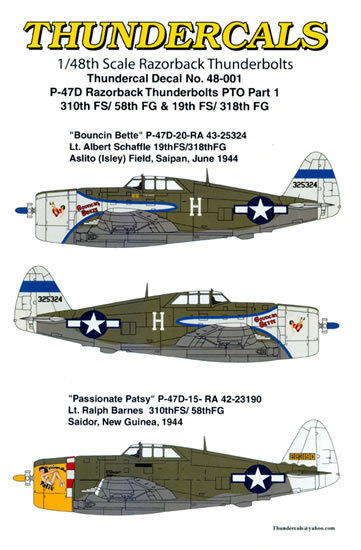 The markings depict the machine when it was flown from Aslito (Isley) Field on Saipan Island by a Lieutenant Albert Schaffle in the June of 1944. It is in the standard factory applied olive drab over neutral grey camouflage scheme but sports bare metal wing tips, vertical and horizontal stabilisers and engine cowling as well as a large swath of the forward fuselage with the latter edged with blue (squadron colour). The blue paint was also applied to the spinner dome and in the form of 12" wide stripes around the vertical and horizontal stabilisers. Decals are provided for the stripes as well as the edging to the nose/fuselage area. 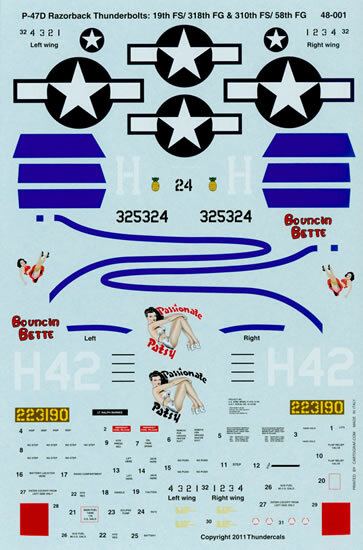 Nose art in the form of a red painted name “Bouncin’ Bette” and red dress wearing girl is worn on both sides of the engine cowling/forward fuselage. The pilot’s name is worn under the canopy in white on the port side of the fuselage as are two painted pineapples. The aircraft’s serial number is worn on the vertical stabiliser in black and the squadron indentifying letter (H) is worn on both sides of the fuselage in white. The wheel covers sport white stars on a blue background and the numerals 24 in black worn on the forward part of the lower engine cowling round out the markings of what is a colourful bird to say the least. 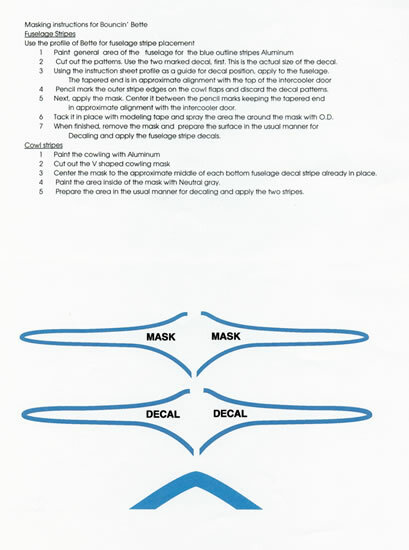 The blue stripes are provided as decals and the placement guide provides you with two pair of paper masks and written instructions on how to use them to assist you with the painting of the natural metal and the neutral grey of the fuselage. A trip to the Gallery page on the 7th Fighter Command website at http://www.7thfighter.com/gallery/7th_gallery.htm will provide you with some black and white images of the machine as well as other 19th Fighter Squadron machines. “Passionate Patsy” P-47D-15-RA 42-23190 flown by Lieutenant Ralph Barnes of the 310th Fighter Squadron, 58th Fighter Group, 5th Air Force from the Saidor Strip, New Guinea in 1944. An olive drab over neutral grey camouflaged machine, it wears theatre markings comprising a white vertical stabiliser/rudder and leading edges to its wings as well as a yellow painted spinner dome and engine cowling. The cowlings cooling flaps are (alternately) natural metal and red. The serial number is in yellow on an olive drab background on the vertical stabiliser (which Thundercals have thoughtfully provided as a one-part decal) and the identifying letter (H42) is in white on the fuselage sides. Two separate versions of the nose art and are provided, one with the name in red and one with the name in black and the notes on the placement guide advise that these two options are provided as it is not confirmed which was the correct colour. The placement guide is A4 in size and provides large colour side profiles of each machine (Bouncin Bette has both sides depicted whilst Passionate Patsy has just the port side depicted) as well as generic line drawings of the upper and lower surfaces. The guide also holds fairly comprehensive notes on each aircraft as well as guidance on what propellers were fitted to each machine. Modelling notes are also carried and they advise that decals are “sized” for the Tamiya kit. 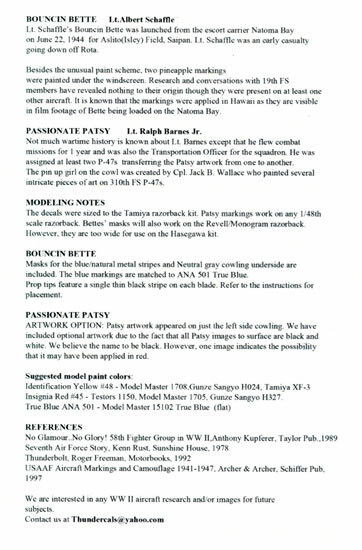 A list of references and suggested matches to model paints are also carried on the sheet. A second A4 sized sheet is also included and this carries the aforementioned masks for the Bouncin Bette option. The decals themselves have been printed by Cartograf. They are thin with a minimal carrier film and everything on my sheet is in perfect register. A single set of national insignia as well as a single set very comprehensive set of stencil data is provided.